Global digital advertising spend reached $209 billion in 2017. Whether on mobile, social or the web, consumers are receiving more marketing messages than ever before. For companies to cut through that noise, advertisers must deliver relevant content that resonates with every individual. 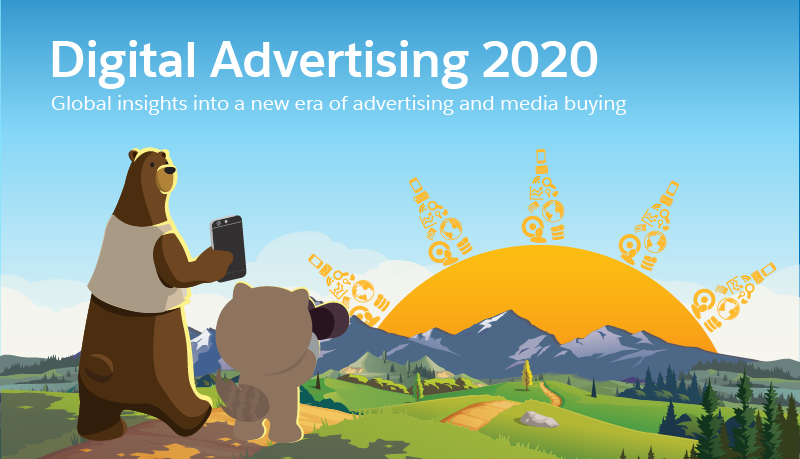 Released today, the Salesforce Digital Advertising 2020 report finds that digital advertising is in a state of massive transformation, driven by consumer demand for more personalized and relevant experiences. Delivering those experiences requires advertising strategy and technology that taps into the full power of data. Brands turn to trusted data sources to personalize advertising for consumers. More than 90 percent of brands have adopted or plan to use data management platforms (DMPs) to manage the scale of their data, while exploring new ways to securely share data with trusted partners. Advertising metrics become more sophisticated. Brands continue to use legacy KPI metrics such as impressions, but are moving beyond simple metrics to quantify the lifetime value of a customer gained through advertising. In the next few years, new technologies including artificial intelligence (AI) will further empower advertisers with innovative ways to engage consumers. For example, nearly three quarters of advertisers either currently advertise or plan to on voice-activated digital assistants powered by AI in the next 12 months. Let’s take a closer look at the trends that are shaping the future of digital advertising. Advertising and marketing have historically engaged with consumers separately, operating on different teams with their own budgets. 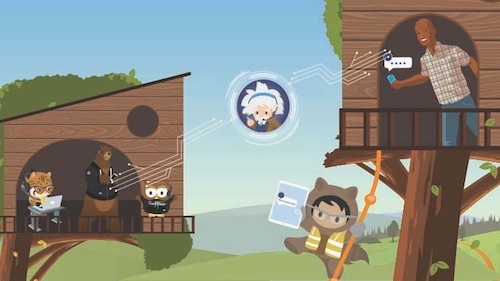 Now, these teams are breaking free from their silos and merging together to deliver connected consumer experiences. 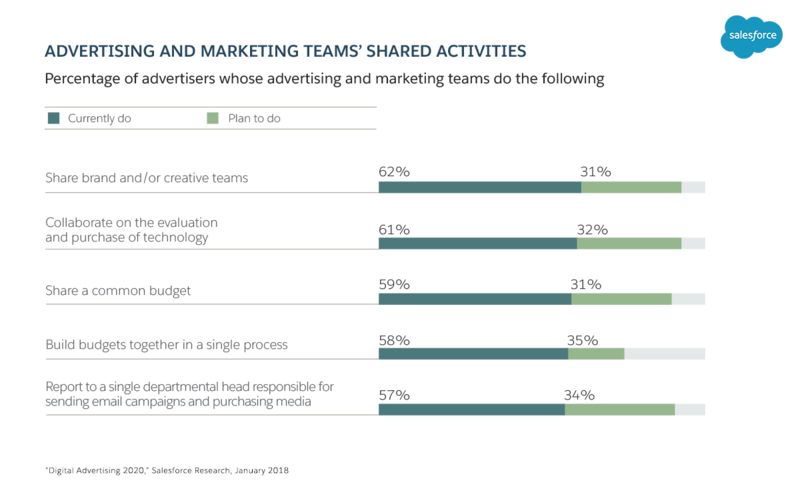 The majority of advertising and marketing organizations now share common budgets and use the same team to manage digital marketing, build ad campaigns and make technology purchasing decisions. With most of the information they need in one place, advertisers can handle more digital advertising in-house. Nearly 60 percent of advertisers rely on internal staff to optimize ad spend for Facebook and Instagram, and 57 percent do the same for Google search. Click here to see a larger version of the above image. The number of consumer data sources that brands use to inform their digital advertising strategies continues to grow. 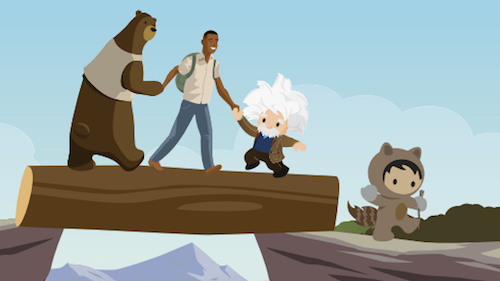 With more opportunities to capture and leverage consumer data, brands have never been closer to reaching advertising’s North Star--engaging the right audience, with the right message, at the right time. Advertisers use a range of data sources to inform their strategies, including their own CRM data (such as email addresses and phone numbers), online data (information consumers share when browsing a brand’s website) and demographic data (such as a person’s location determined by their mobile device). Last year, advertisers used an average of 5.4 unique data sources to power digital advertising. Next year, they’re planning to use an average of 6.2. 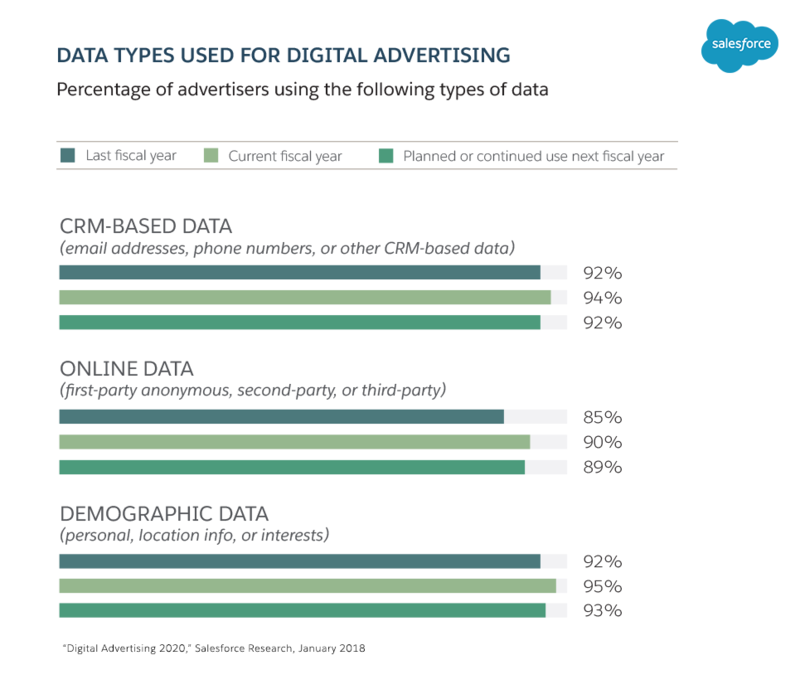 Almost all advertisers turn to customer relationship management (CRM) as a first-party known data source, with 94 percent of them currently using CRM data to reach their intended audience. Ninety percent of advertisers use some type of anonymous online data to better reach consumers through digital advertising. Two of the most popular types of anonymous data sources include first-party anonymous data and second-party data. Seventy-one percent of brands use anonymous first-party data from their owned properties. This includes visits to their own web page or ad impressions. Brands are increasingly turning to second-party data to improve their advertising. Over the next two years, advertisers’ use of second party data will grow by 26 percent to be used by 64 percent of all advertisers. [Tweet this.] Second-party data is when a brand agrees to share its own anonymous data, for mutual benefit, while honoring the consent of its own users. For example, News Corp. packages its website visitors in desirable segments for advertisers to use in their consumer engagement efforts, while maintaining data privacy and brand safety controls. Facebook and Google appeal to advertisers because of their massive audiences and ability to interact with consumers based on real identities. Driven by their strengths in mobile and programmatic video advertising, it’s no surprise that Facebook and Google will continue to grow as digital advertising powerhouses. Next year, 66 percent of digital advertising spend will go to Google Search, YouTube, Facebook and Instagram—that’s not including additional platforms or display advertising exchanges owned by these parent companies. Mobile and video content are becoming more prevalent in digital advertising, and across platforms such as Facebook and Google. 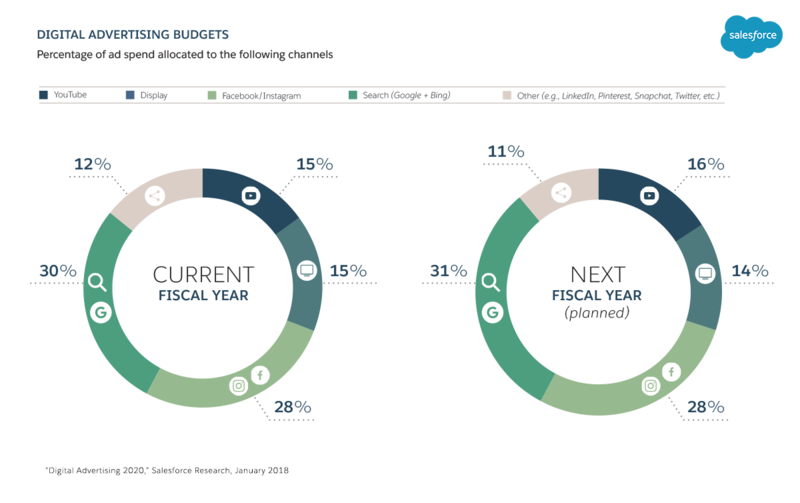 Over the past year, 65 percent of companies increased their video advertising budgets. More data at advertisers’ fingertips means more opportunities for them to measure the effectiveness of engagement. But first, companies need to align on how they measure success, which is currently in a state of evolution. While brands continue to measure success against legacy KPI metrics like impressions, they’re moving to more complex metrics such as the lifetime value of a customer. The two most important metrics cited by advertisers are the complex notion of the lifetime value of a customer (27 percent) and the relatively simple measure of impressions or web traffic (19 percent). Advertisers use a variety of methods to measure results. Many traditional tools such as spreadsheets (42 percent) are still popular. 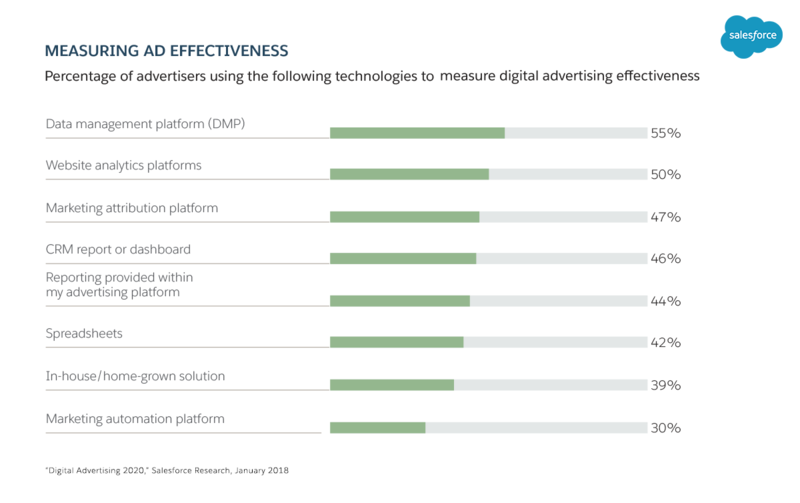 But, more teams now use DMPs (55 percent) and web analytics platforms (50 percent), indicating a turning point for advertisers’ sophistication in assessing performance, measurement and attribution. Looking ahead, innovative technologies such as AI will present advertisers with exciting opportunities to reach audiences in new ways. More than 30 percent of brands are already using Smart TVs, voice-activated digital assistants powered by AI, wearable devices and augmented or virtual reality to advertise. However, the real power of AI rests in the ability to leverage automated and predictive technology throughout the entire consumer experience, delivering personalized engagement across every consumer touchpoint. This study was conducted by Salesforce Research through via FocusVision in November 2017. Respondents included 900 full-time advertisers, media buyers and marketers with seniority of manager or higher. The study includes significant representation from respondents in the United States, Canada, France, Germany, Ireland, the Netherlands, the United Kingdom, Japan, Australia and New Zealand.